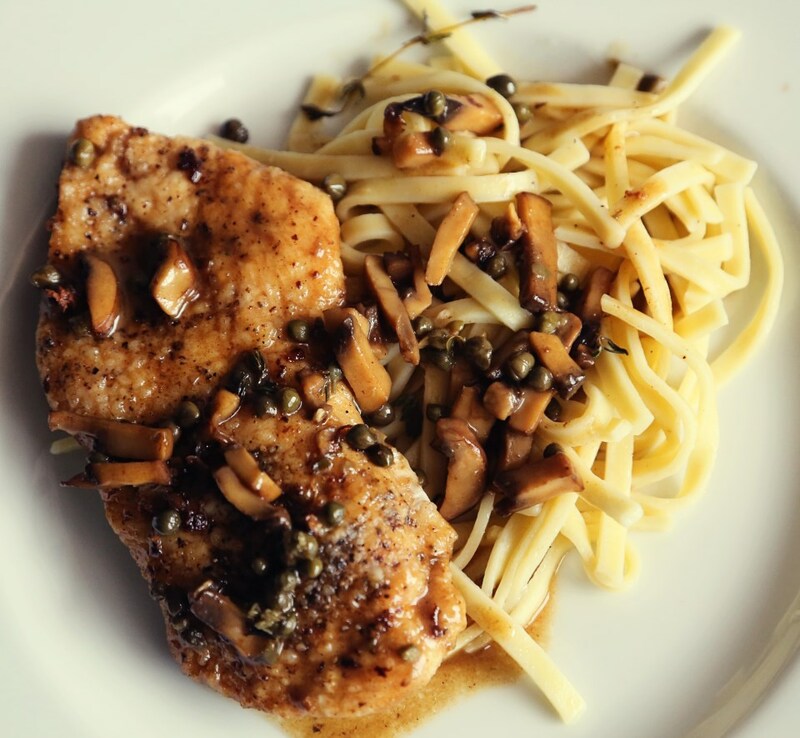 For the first meal, I did a simple chicken piccata with mushrooms and thyme and some soft, buttered noodles. It was very comforting and yet refreshing at the same time. 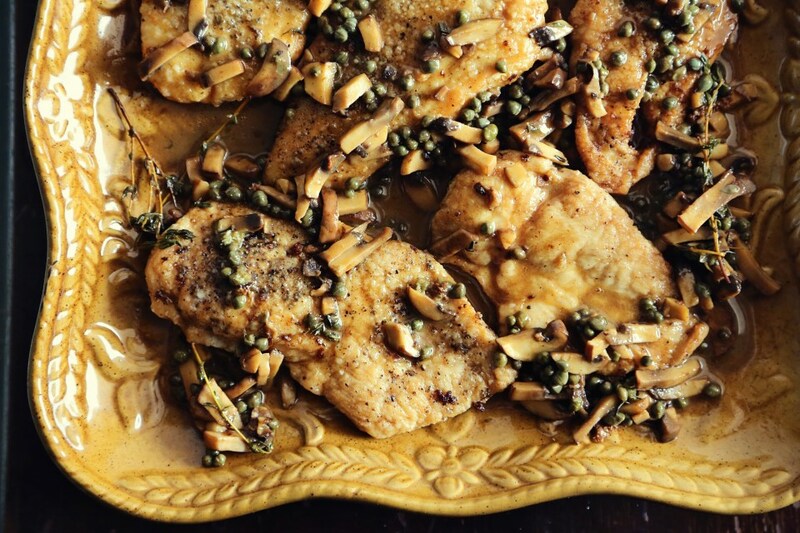 I love the bite of the lemon juice and the capers in this dish and so for a twist, I added my favorite herb, thyme, instead of the traditional parsley and I also added some sauteed baby portobello mushrooms. It all came together great and we thoroughly enjoyed our first meal from the shiny new stove! Heat your oven to 200F. This is to hold your chicken as you cook it and until the noodles are ready so that everything stays hot until you’re ready to serve. Butterfly the chicken breasts by sliding a very sharp knife length-wise into the thickest part of the chicken breast (kinda like you’d cut an english muffin in half) and lay the chicken breast open and cut down the middle, forming two, thinner cutlets. Do this with the remaining chicken breasts and dry them on both sides and season both sides with a sprinkle of kosher salt and fresh cracked pepper. Heat the oil and 2 tablespoons of butter over medium high heat in a large, stainless skillet. When the butter starts bubbling and popping, coat each chicken breast in flour, shake off the excess and lay floured cutlets on a paper towel until ready to fry. I worked in two batches – three pieces at a time. Fry for about 3-5 minutes per side, until golden brown and an instant-read thermometer says at least 160. (It’ll cook some more as it sits to warm in the oven.) Place fried chicken on a plate and place in the oven to keep warm as you fry up the rest. For the second batch, add two more tablespoons of butter to the pan before frying the rest. Remove the chicken and place on the platter in the oven. Add the lemon juice, chicken stock and capers and thyme to the pan and scrape up the brown bits and season with salt and pepper. Add the mushrooms and let the sauce reduce for a couple minutes. Remove from heat and whisk in the remaining two tablespoons of butter and spoon sauce/mushrooms over the chicken and serve with buttered noodles. 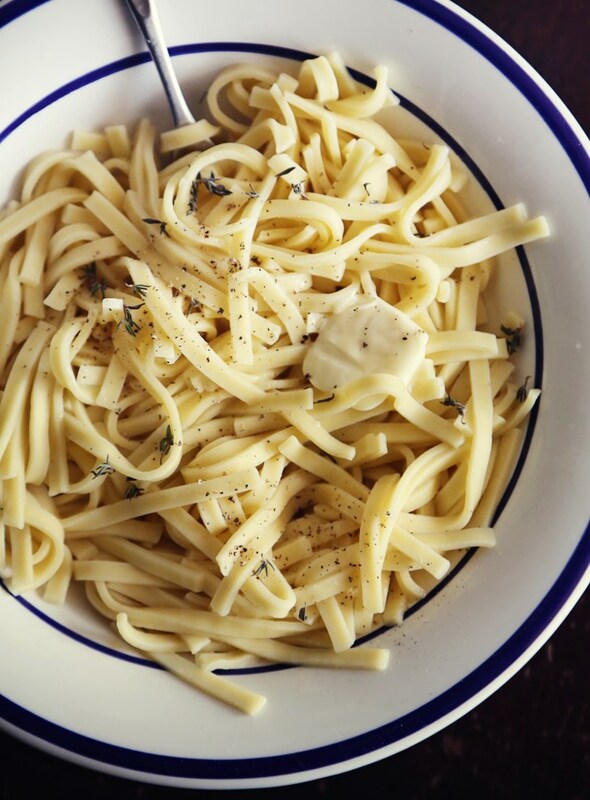 To finish the noodles once they are done boiling, add the drained noodles to a bowl, add a splash of pasta water, a tablespoon of butter and fresh cracked pepper and stir to combine. Garnish with fresh chopped herbs if you like! 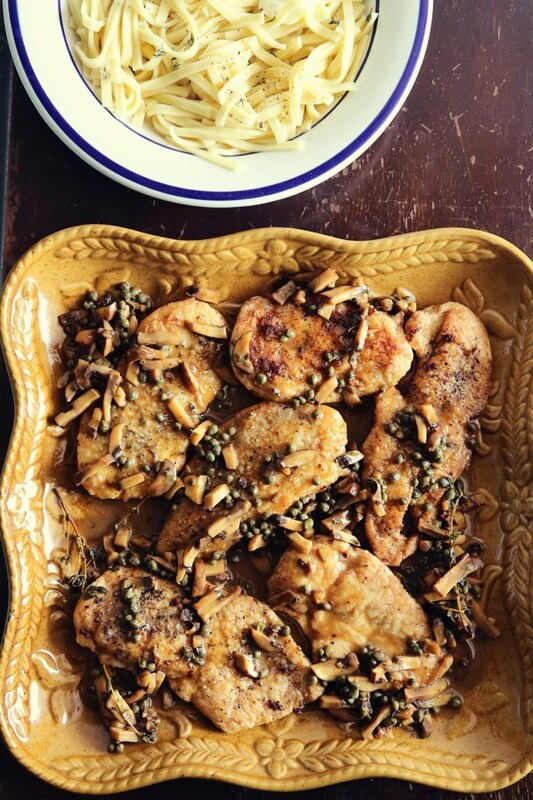 This entry was posted in Butter, Children, Hearty, Making Lemons into Lemonade, Meat Dishes, Monday Meals and tagged buttered noodles, butterflied chicken, capers, chicken cutlets, chicken piccata, easy chicken dinners, family meals, kid-friendly, portobello mushrooms, weeknight meals. Bookmark the permalink. Every time we move a gas stove/oven is on the checklist of “acceptable” places to live! ha ha – Your new stove-top’s first production looks fabulous! !